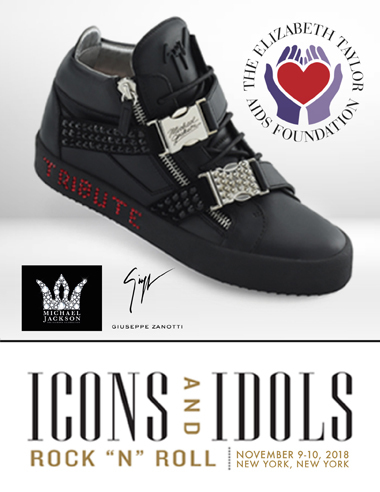 Giuseppe Zanotti and The Estate of Michael Jackson announce "Giuseppe Tribute to Michael Jackson" Pair "Number One"
Created in honor of Michael Jackson's Diamond Birthday Celebration to be sold by Julien's Auctions at The Hard Rock Cafe Times Square on Saturday, November 10th with 100% of the proceeds benefiting The Elizabeth Taylor AIDS Foundation. This one-of-a-kind pair of Tribute sneakers is the only pair of the limited edition that will have been further embellished with approximately 120 genuine black diamonds (108 karats) and approximately 55 rubies (18 karats) in place of the black and red crystals. The pair will be handmade for the winning bidder and customized to their size. The shoes will be signed by Giuseppe Zanotti and accompanied by a GAI certificate, guaranteeing the authenticity and quality of the gemstones.